What is the Most Durable Hardwood Flooring Option? Whether you are replacing old flooring or starting a flooring project from scratch, it can be difficult to choose what type of flooring is the best option to put in your home or business. There are several types of flooring on the market today. However, the hardwood flooring trend has become in today’s homes and businesses due to its sleek look and incredible durability. What kind of hardwood flooring should you get? Should you get solid hardwood, engineered hardwood, or laminate that looks like hardwood? When it comes down to it, most people want to know what hardwood flooring is the most durable. HOW DURABLE IS SOLID HARDWOOD FLOORING? When most people think of hardwood floors, they think of solid hardwood flooring. This type of flooring comes in a variety of choices as there are several different types of species of hardwood flooring. You can choose from maple, oak, cedar, and pine. 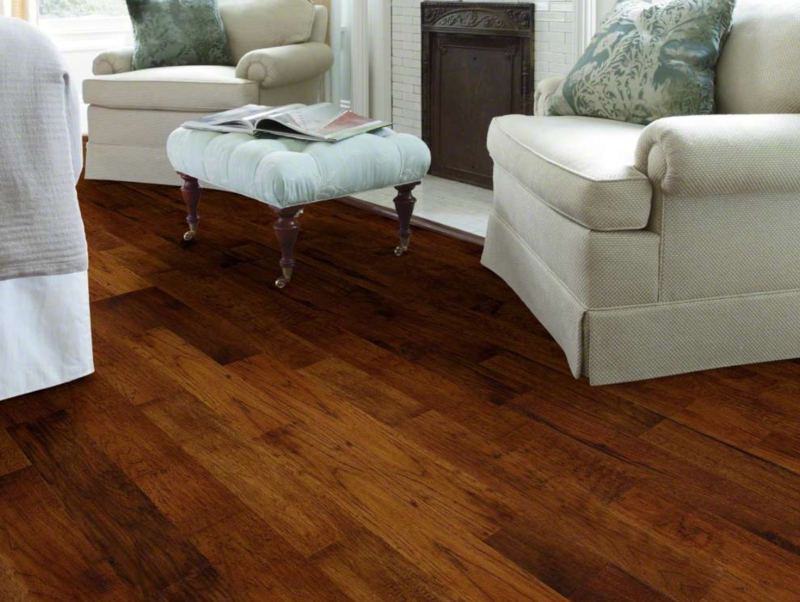 You can also choose more exotic hardwood flooring such as teak, Brazilian cherry, or Australian cypress. When durability is a deciding factor, you may want to look at the wood’s Janka rating or measurement on the Janka scale. This rating gives you an idea of how hard one species of wood is over another species. For example, if you know that you want oak hardwood floors, the Janka scale would show you that white oak is harder than red oak and could be more durable. While choosing solid hardwood flooring options may not be the most affordable option, these floors are known for lasting decades if properly maintained. When they get scratched or faded from the sun, you don’t have to replace them. You can have them repaired or sanded by professionals like at Village Carpet. HAVE YOU HEARD ABOUT ENGINEERED HARDWOOD FLOORING? The big downfall of solid hardwood floors is moisture and humidity. This can limit the places where you can or should install solid hardwood flooring. The next best option is engineered hardwood flooring. Engineered hardwood flooring is still composed of solid wood. However, instead of getting a single, solid plank of wood, engineered hardwood flooring is made in layers. Because of the layering design of engineered hardwood floors, they are more resistant than traditional solid hardwood floors. They are a great choice for high-traffic areas and can even be placed in areas with heat and moisture such as basements. The best part is that the top layer of engineered hardwood floors can be sanded and refinished like solid hardwood floors. Sometimes you have to go with what your bank account will allow. Laminate flooring is still made of wood and a good option for those who aren’t ready to make a long-term decision or who like to change things up every few years. Quality laminate flooring has come a long way in the past few years and now it’s possible to get the look and feel of hardwood flooring without the steep price tag. But how durable is laminate? Like solid hardwood flooring, laminate flooring is not a good choice for areas of the home that have high levels moisture such as bathrooms, basements, and kitchens. However, the wear layer of laminate flooring protects against most scratches and dings. It’s also easy to clean and it’s a great flooring option for those with pets. If you are still not sure which hardwood floors are best for your lifestyle and budget, then come into Village Carpet Shop. We would be happy to go over your options and show you our tops brands and what they can do for your home. Remember, at Village Carpet Shop we help you take care of everything from start to finish. Know what you want? Give us a call today to schedule your FREE flooring estimate.